Another WONDERFUL meal we had from Pinterest. THANK YOU PINTEREST!!! 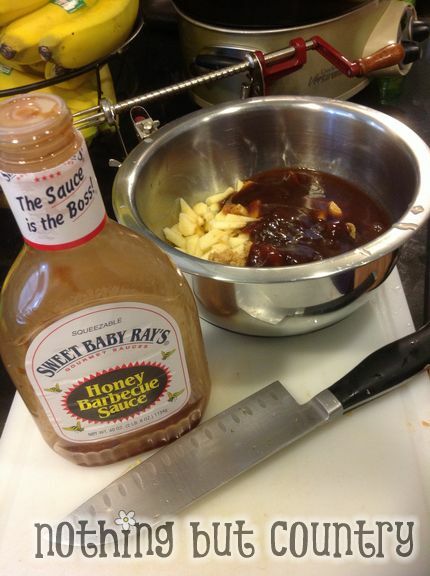 BBQ Sauce (sweet baby ray’s is a MUST!!! ) If you haven’t tried that BBQ sauce yet– you really do need to! Put all the wet ingredients in a bowl and mix up. 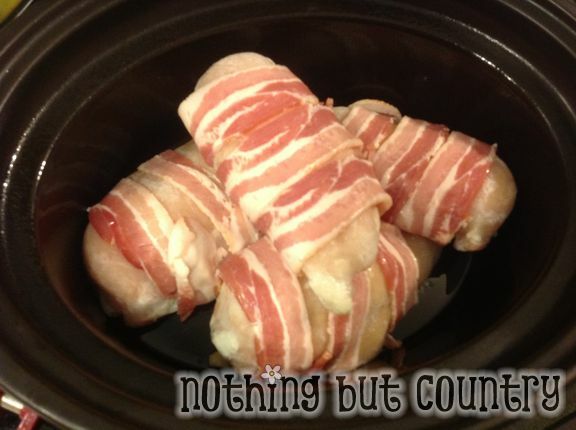 Recipe suggests 2 pieces of bacon per chicken. However I had pretty large chicken breasts and it didn’t seem it got enough coverage of bacon. HAHA. So I put 3 pieces on per chicken YUM YUM!!! 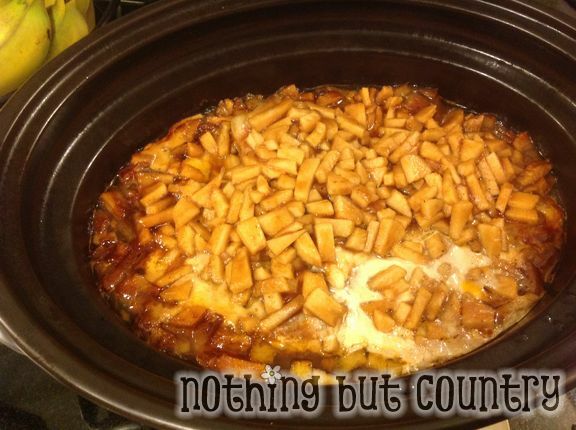 Pour the apple mixture over the top… allow to cook…. A few agonizing hours later .. (agonizing because you have to smell this yumminess cook all day and it is amazing!!!) You get the most delicious chicken breasts and apples ever. My kids thought it was dessert too! I forgot to get a photo of it on my plate. It didn’t last very long. We all scarfed our dinner up quickly. Another successful recipe off Pinterest!!! We will make this again for sure!! I can only imagine how amazing this dish smells and tastes! 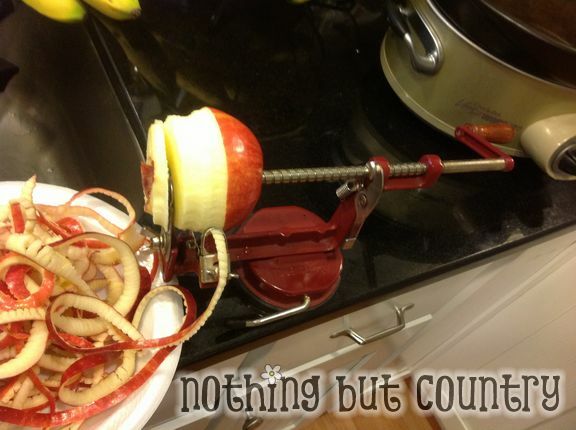 I’ve got to have one of those apple peelers! I checked and they are so inexpensive. Thanks for the tips and the recipe. 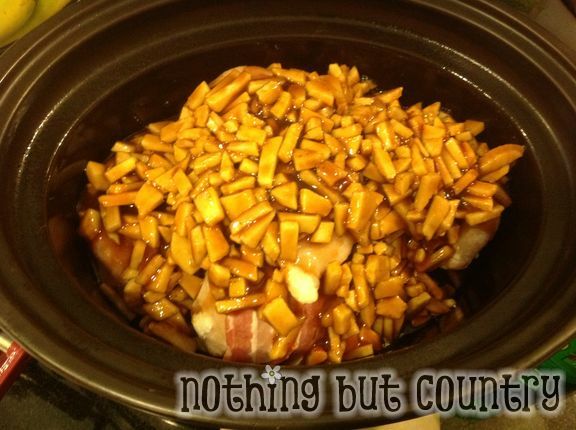 I came in second at a crock pot competition with this recipe. The judges said I lost by one point because I didn’t do anything for presentation. It was the favorite recipe though!